HLN will be moving into CNN‘s Studio 7 in Atlanta as the network moves the last of its live daytime programming to New York City, TVNewser has confirmed. The current Studio 7 set debuted in mid-2010, a few months after NewscastStudio obtained photos of what turned out to be the set under construction. As the network has continued to shift on air personnel to New York City, the studio has become used less and less. 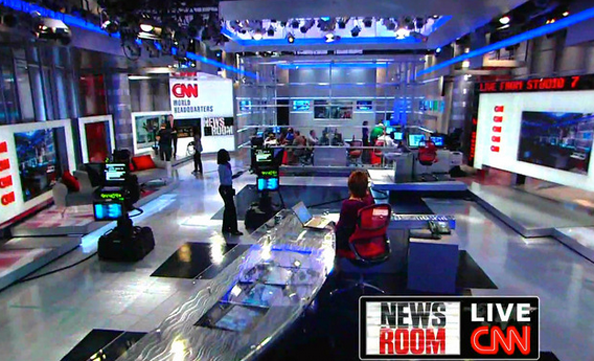 HLN, meanwhile, currently originates much of its programming, including “Morning Express with Robin Meade,” from another studio in Atlanta on the bones of a set that was originally built for when CNN Headline News switched to a two anchor format in 2001 and was then extensively overhauled with a plethora of printed graphics. The New York programming will originate from the network’s Time Warner Center studios, which are scheduled to move to a new building in Hudson Yards in 2018. Earlier this year Time Warner sold its namesake building.